Today marked the five month birthday of the Wombats. It was fitting that it also was the first night of Hanukkah! Wait, that's not fitting at all. It actually had no bearing on the babies' birthday at all. It did, however, give me an excuse to make a special meal. While I was at work today, apparently, the Wombats engaged in some walker races. The races take place in reverse because the Wombats only have one speed and that is reverse. When I got home Jen had put them in their walkers again with their Christmas hats on. It's a Hanukkah tradition! It's great to come home to Martin when he's in a giggly mood. I tried out some of my new stand up material on him. He thought it was hilarious! 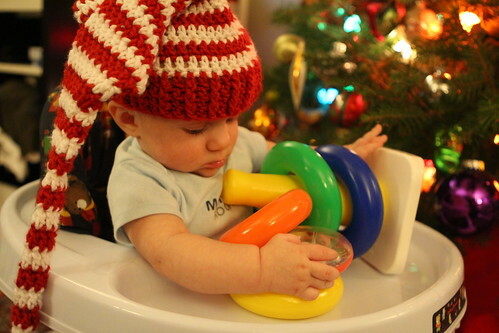 Martin then clumsily played with his classic Fisher Price toy. Elliott, on the other hand, had a solemn moment with Mummy at the computer. This is one of his favorite activities. With the babies distracted I got to work on dinner. Luckily I'd had a bit of time yesterday to prepare a few things. 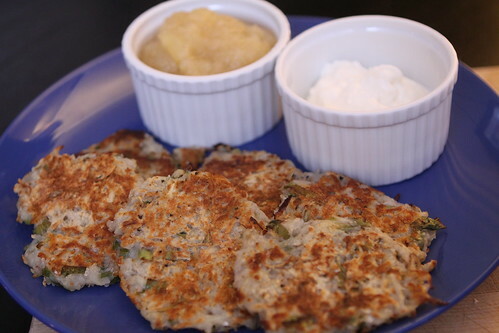 I fried up the latkes which I made with grated potato, onion, green onion, cider vinegar, egg, flour, salt, and pepper. I served them up with sour cream and the apple sauce I made yesterday with Jona Gold and Pink Lady Apples. Sounds fancy, right? It's because I wanted to be really fancy, not because they just happened to be on sale. 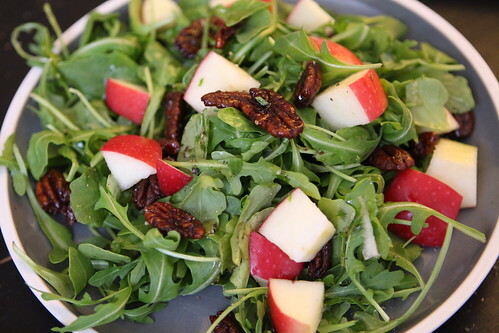 For salad I made this with arugula, Pink Lady apples, candied pecans, honey, lemon, olive oil, salt, and pepper. When going to put it on the table I tripped over some baby toy and almost broke my skull. You will note, however, that the salad's presentation suffered very little in the fall. It didn't look exactly how I'd originally plated it but I'm still proud of my catlike reflexes. 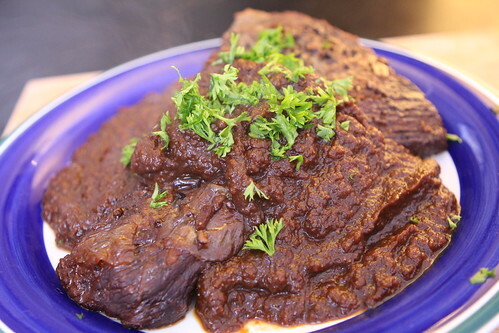 I made a brisket which I browned in a pan with garlic, onion, celery, and carrots. I topped it off with some turkey stock and threw in some sliced, dried figs before braising it in the oven. 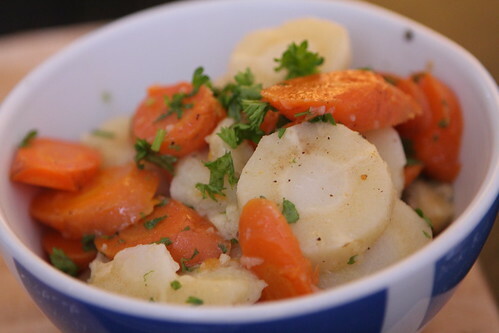 As an accompaniment I boiled some sliced carrots and parsnips which I tossed with butter, parsley, salt, and pepper. Jen is a huge fan of the parsnip so I thought she'd appreciate me working it into the meal since each week she asks about buying the parsnips at the farmer's market. I usually talk her out of these purchases because the smallest parsnip at the farmer's market generally has the circumference of an oak tree trunk. 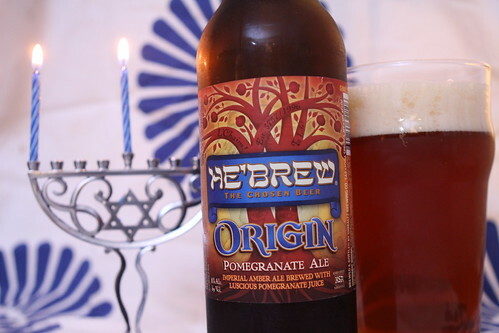 To go with the meal I served up this Origin Pomegranate Ale from Shmaltz Brewing Company. It was a bit stronger than I'd expected and did not have a very pronounced flavor of pomegranate. Apparently the batch is "brewed once again after 10 years with the juice of over 10,000 luscious Pomegranates." After we ate we fed the babies before bed. 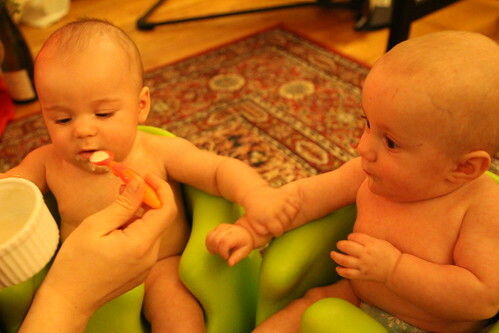 For the first time ever we fed them their rice cereal before their bottles. It was like throwing raw meat to wild lions. They were snorting and clawing at each other to be the first one to get a spoonful. After bathing them and getting them to bed I served up this Lebkuchen which I'd made before dinner. 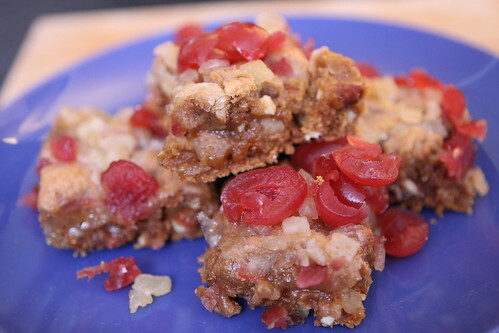 It was made with honey, candied lemon peel, almonds, maraschino cherry, and flour which I baked then topped with a milk, sugar, and vanilla frosting and topped with more candied lemon and cherries. It was a perfect way to use up some leftover fruit cake ingredients and made for a very sweet and tasty dessert. December is my favorite month and so far it's been off to a great start. It'll all be over in a flash so it's nice to take advantage of every moment this time of year to enjoy the tastes and activities of the season. It's also nice to enjoy the smiles of the Wombats who think I'm hilarious even when I'm just making grunting noises at them. Soon they'll be rolling their eyes at me and asking to borrow the car keys.